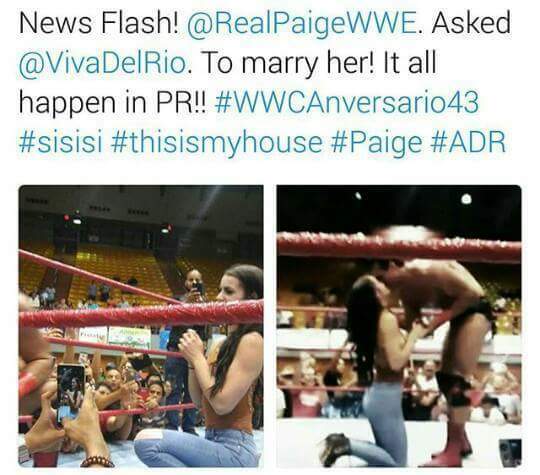 Breaking news and somewhat heartbreaking news as well, Alberto del Rio proposes to Paige. Thats right. The 434 Club reports that the two former WWE champions are officially engaged. The cool thing was that the whole proposal was done in the ring, in front of a live audience. We’re still looking for a video from the WWC event because we are curious as to why Paige was still kneeling down while Patron formerly Del Rio is the one standing up. Still, congratulations are in order for the controversial couple. Del Rio is now currently working the independent pro-wrestling circuit using an earlier alias. Meanwhile Paige was recently suspended by her wrestling promotion, WWE due to a violation of the company’s infamous wellness policy. Its her second violation and has been given a 60 day suspension. If you think about, getting hitched is a good time for them. And that includes a honeymoon too. By the time their getaway’s over, Paige can get back to the WWE or finish her contract and follow her husband/ fiancè. Previous story Will Rockstar Games Announce Red Dead Redemption 2 Already?